This bundle contains all of the material necessary for teaching Personal Finance in a classroom. For more details click on the individual product or see description below. 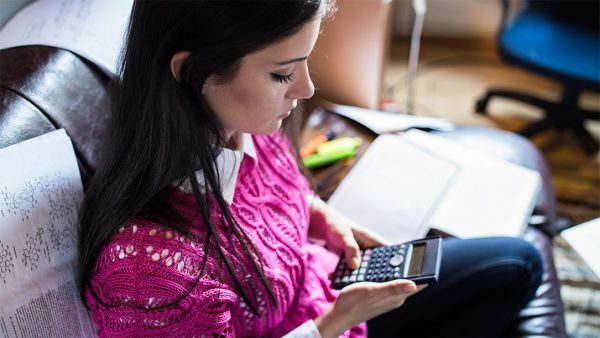 Personal Finance is part 1 (1 semester) of the Consumer Math course. These courses are designed to fulfill general math credit for high school students. The focus is on applying math skills to real world situations, not the mechanics of how to do the math. Get a full year of access to the curriculum online as you teach students learn about math by applying the principles being taught in real life. Success means you stay out of debt. The richest person gets an “A”. Topics include: How do I get a job? How much money am I worth? How do I pay my bills? With a 1 year subscription to the CTM Bank, one instructor can access and manage their students bank accounts. The pricing is based on the number of students the teacher will be tracking, ranging from $30 for 5 students to around $410 for 200 students. The Student Interactive Workbook is set up unit-by-unit with sufficient time-cards and Cornell Notes Pages for the 20 week Personal Finance course. Each unit section includes the necessary time-cards, Cornell notes pages, math skills worksheets, projects, and forms. Perfect Bound Checkbooks includes 25 Check Registers, 200 individually perforated checks, full-color Check Writing Guide, and full-color Check Register Guide. A convenient copybook for teachers to use. 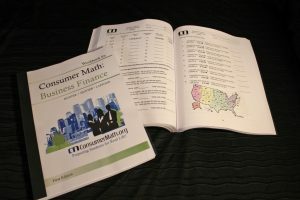 Includes a hard copy of the worksheets, projects, forms, tests, and finals the teacher would hand out to their students during the Business Finance courses. Each manual includes printed copies of worksheets and answers, quizzes, tests, projects, forms, and the final. This allows you to download all of the personal finance files for your electronic library. Worksheets, tests, quizzes, and forms are all PDF format. Lesson presentations are PowerPoint files open for you to edit for your own class. There are no video files.